The Bedford Ouse catchment is predominately rural with Bedford as the major urban area. 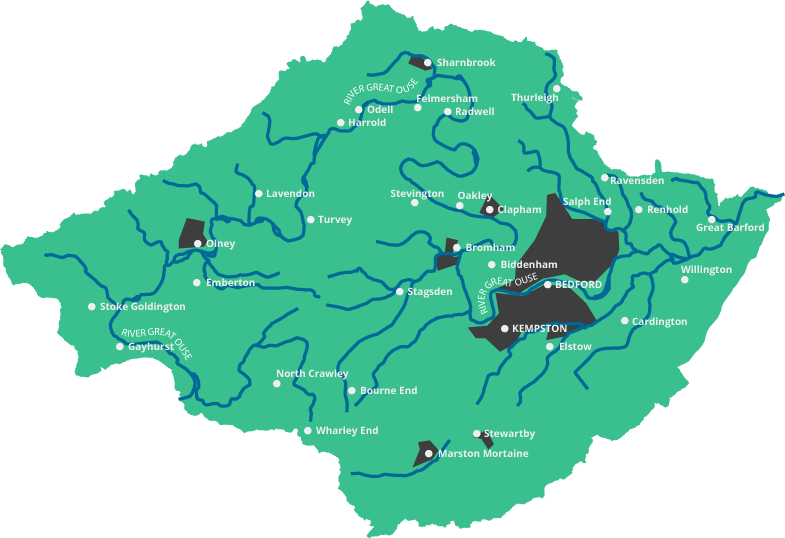 As it flows eastwards from Newport Pagnell to Roxton, the River Great Ouse is joined by the Chichley, Elstow, Harrowden, Cople, Sharn and Ravenstone Brooks. The River Great Ouse has ‘fresh water fish protection’ status. The area is particularly important for priority species such as the depressed river mussel. It’s also the Bedfordshire stronghold of the great crested newt. There is significant development growth around Bedford. The Forest of Marston Vale is an important regeneration project, creating a new landscape from the former brick making industry. It has been a busy year on the Gt. Ouse with the set-up of the River Wardens scheme. Since the initial meetings held back in the summer of 2017 we now have a total of 40 volunteer river wardens watching out on the Ouse, Renhold brook, Elstow Brook, and Bromham Brook collectively with a few more interested and baseline survey to be planned in. So far you have all done a great job reporting in your findings, many of you have identified large amounts of Floating Pennywort on your stretches in recent months which has been passed on to the Environment Agency. They have been taking into account your sightings and are happy to report the successful control of Floating Pennywort in 2018 with all the rafts on the Great Ouse controlled and a work programme started for the Gadsey Brook. For positive native species sightings some of you have been lucky enough to have seen otters on your stretches, which is great news! Keep a look out for news on the upcoming Otter, Mink and Water Vole Monitoring project this year! In the upcoming year we are looking to increase the warden’s coverage of the Ouse and expand into other areas of the Upper and Bedford Ouse Catchment with other partners taking on this scheme so we have a better chance of monitoring the health of the whole catchment. Work has finished on the project at Harrold Odell Country Park. The project had two elements the first of which will seek to reconnect a silted up back channel to the main river to provide a refuge area for fish in times of flooding as well as off main channel habitat for invertebrates and small mammals. The second aspect of the project will be re-profiling a cattle poached bank to prevent excess sediment from eroding into the river. I would like to thank you all for your hard work going out and monitoring our rivers health over the last few months. It is volunteers like you undertaking valuable citizen science that allows us all to manage our environment better, directing our limited resources more effectively. Splashing in Puddles… for Adults! Would you like to get more involved with running your local river catchment? The Upper & Bedford Ouse Catchment Partnership is hosted by Bedfordshire Rural Communities Charity (BRCC). BRCC is a company limited by guarantee and registered in England no. 3327628. Registered charity no. 1061538. Photos by members of the U&BO Catchment Partnership and Sid Deakin.